After her first mammogram, in 2009, Katy Tessman was diagnosed with breast cancer. She had a double mastectomy on her fortieth birthday, endured chemotherapy , and underwent reconstruction surgeries. Katy's sons, Louis and Maxwell were only ages 6 and 3 at the time of her diagnosis. ​The family's love of nature helped Louis and Maxwell understand the changes going on with their mother's body. They live in Minnesota and are active volunteers in their community. Before becoming a mother, Katy recorded a CD of 11 original songs and went on two national tours. Katy has a BA from Minnesota State University–Moorhead and is a literacy and makerspace champion. Katy is available for book readings and motivational speaking events; as an author, she aims to help families find strength, courage, and optimism. The Minnesota Women's Press named Katy a Changemaker in recognition of the positive effect her book has made on women and their families. The Mom’s Choice Awards® has named "Our Mama is a Beautiful Garden" as among the best in family-friendly media, products and services. ​In 2011, Katy was a model for Of Scars, a photo project that explores all the facets of living with the emotional and physical scars of breast cancer. The Children's Theatre Company in Minneapolis honored Louis and Maxwell in 2011, naming them Young Heroes, recognizing how they faced their mama's breast cancer with the courage only a true-to-life hero has. In 2012, Katy was the cover girl in Patterson Dental's "Grins for a Good Cause" annual giving program. 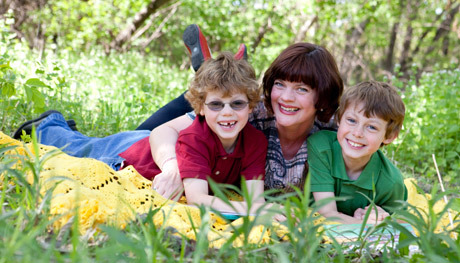 Katy and her sons are featured in the 2013 Hope Chest for Breast Cancer Foundation's calendar. Artist, Barbara Porwit created a larger-than-life painting of Katy as Wonder Woman for her Breast Cancer Superheroes portrait series in 2013. October 2014 marked Katy's 5th year of being cancer-free. 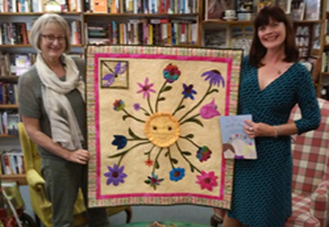 In celebration, 15-year survivor Judi Lundstrom presented Katy with her award winning quilt inspired by Our Mama Is A Beautiful Garden. Katy and her sons, Louis and Maxwell, celebrated the 5th anniversary of Our Mama is a Beautiful Garden in 2018 with a special 2nd edition.